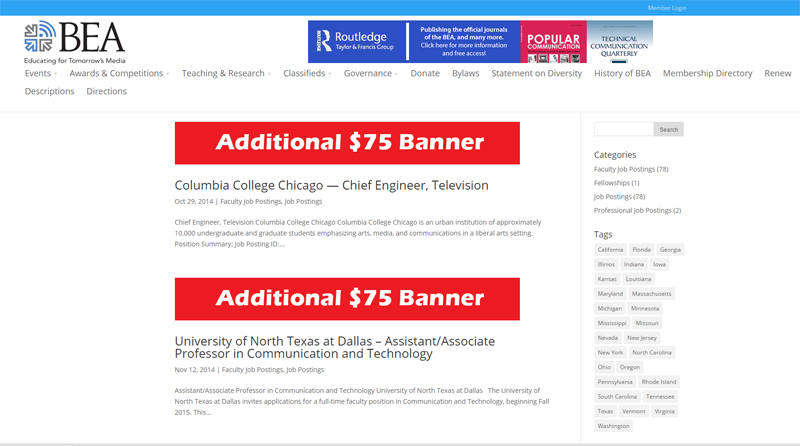 Banner Ad – For an additional $75 we will add a 728x90px banner to the top of your posting (see below for example). Package Bundle – For an additional $125, you will receive both of the above benefits and a Free posting of your job on our Facebook page. All postings will remain online for 90 days, unless requested to be taken down prior to the expiration date. After posting has been submitted to BEA it will appear in the next BEA bi-weekly newsletter. Newsletters are sent every other Tuesday. There is no maximum word count on postings. No ALL CAPS sections of the posting will be posted. Please use title case. No multiple position postings are allowed. Each listing will contain one open position. All postings will be live, on the website, with in 48 hours of submission and payment.